There are three well-known safety matters concerning Silver Shadow series cars which have been hovering around since they were built. Those are the final drive torque arm on early cars, the main steering pendulum lever on cars with steering boxes, and the final drive crossmember. 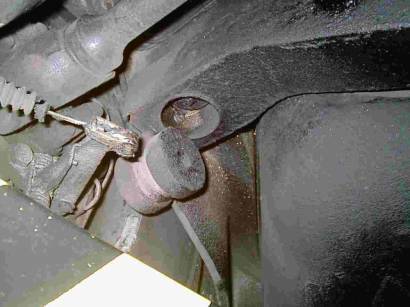 Decades ago I knew of the final drive crossmember and torque arm failures. I learned the hard way of the last failure when the pendulum lever broke a few years ago on our T-Series, SBH13247, delivered in Sydney, October 1972. A U-Turn became a Pirouette. Thank goodness: no crash. I have read many articles about the weaknesses in the torque arm and the final drive crossmember, but was feeling smug because ours had been modified back in the 1970s by the Sydney dealer. Late last year, my father stopped the T-Series at the sign a block from home in Canberra, and gently proceeded onwards. Bang crash, the final drive crossmember came adrift, and bits spilled all over the road. Thank goodness: again no crash. The car has spent most of its life swanning graciously around Canberra’s boulevardes doing as a family car should, but imagine if it had failed the day before on Bungendore’s bumpy gravel roads with honoured guests aboard ? What the hell was that ? 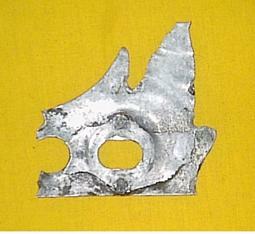 The final drive crossmember had ripped out from the floor of the car. Safety issue No 4 had reared its ugly head, as subsequent research has shown that this particular failure is becoming alarmingly frequent as the cars age and fatigue. The solution ? 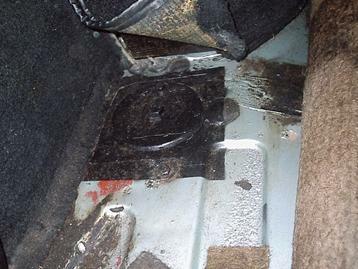 Reinforce the boot floor and the small subframe which together hold the final drive crossmember in place. It’s better to do the strengthening before it fails, and thereby save thousands in peripheral damage to the exhaust, differential and half shafts to start with, not to mention injuries in a probable crash. The diagram shows the standard original unmodified arrangement in cross section. 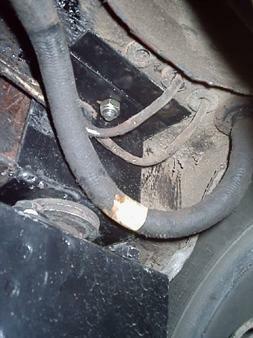 Note that the load is taken by the boot floor and the small subframe fixed to the bodyshell. The distance tube (item 2) holds it all firm. However, the boot floor and the small subframe sections are clearly too flimsy and failed through fatigue over time on our car and others. Note also the mismatch in the diameters of the distance tube and the washers: not good practice, especially with such small gauge metal. Since repairing our car, other owners have been alerted. Fortunately, they have discovered impending catastrophes and avoided them. This is the piece of sheet metal which ripped out from the boot floor. Note the complete absence of corrosion anywhere, but rusty cars will be at even greater risk. To reinforce the small subframe supporting the final drive crossmember, we devised a Z-bracket. 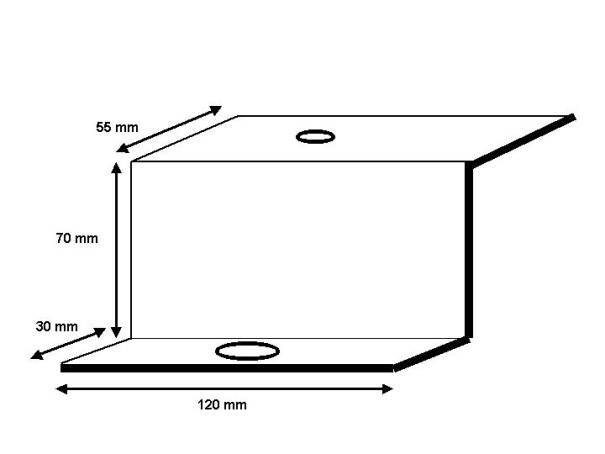 Its dimensions are shown in the sketch below, but the 70 mm offset should be checked in each case. It is fabricated from 4 mm mild steel plate. 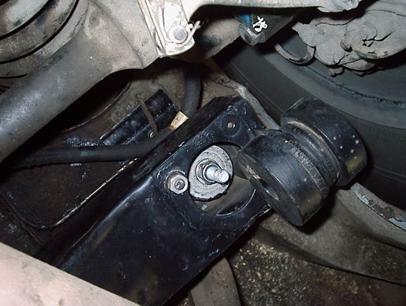 The Z-bracket is secured to the boot floor by a small bolt purely to ensure that the final drive crossmember is correctly located during assembly, and sits above the subframe silentblock mounting. The two large washers (original) can be seen between the subframe and the mount centre left. One may be removed on each side if it makes the half shafts straight, but that should be decided on a case-by-case basis. There was no welding undertaken on the car. This decision was made so not to introduce new stresses or fatigue sites. The repaired section was simply boxed in to make it extremely sturdy. The Z-piece, the large washer plate in the boot and the distance piece are all held firmly boxed together by the main final drive crossmember mounting bolt. The whole arrangement is held in very securely. 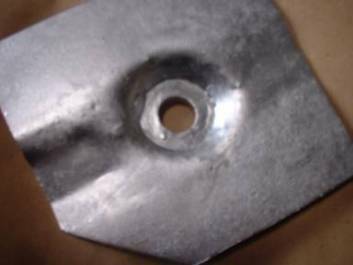 Here is the large 4mm washer plate in the boot. Both sides are modified with washer plates and Z-pieces. The washer on the right hand side should be profiled as the sheet metal steps at the rear. 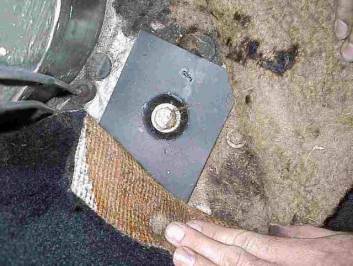 Below are two other incarnation of the boot floor reinforcement. Clearly just about anything will do. So, back to the problem in the 1970s. 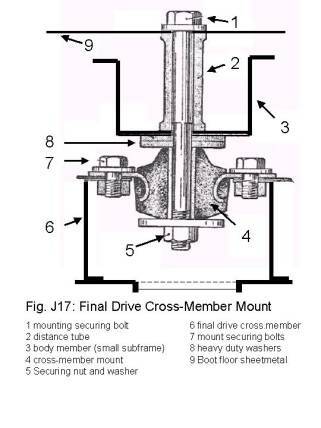 Below is an unmodified final drive crossmember. If yours looks like this, just panic slowly. Here is the final drive crossmember as modified in the late 1970s by the Sydney Rolls-Royce distributor. Note the revised harmonic balancer mounts to Silver Shadow II specification, and the through-bolts and distance tubes boxed in for the silentblock mount. Compare that to the diagram in the workshop manual in fig. 1. It is very much stronger as modified. Despite this, a warning !! The final drive crossmember was showing cracks despite this essential modification. 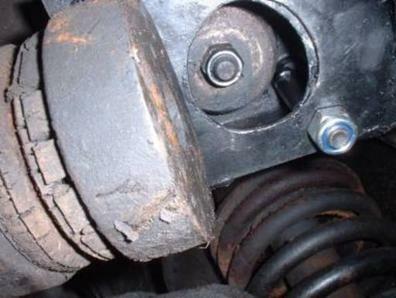 We had it repaired, strengthened and checked for straightness yet again by a subframe specialist in the ACT. Apart from fabricating the Z-piece, this was the only welding carried out. We used Nylock nuts on the new main bolts. Below is a crossmember modified recently in the UK in response to our warnings. Both the crossmember and the boot floor are now reinforced using 14 gauge mild steel plate. Note the similarities to the factory modification. However, fabricated plates top and bottom provide a very sturdy solution. The factory modification does not employ a plate on the top of the crossmember. The original harmonic balancer mount is retained here, whereas the factory modification requires a new combined plate and harmonic balancer mount underneath. No Z-brackets are fittred, probably a sound solution as the failure had not yet happened. Instead, a wider distance tube is applied. 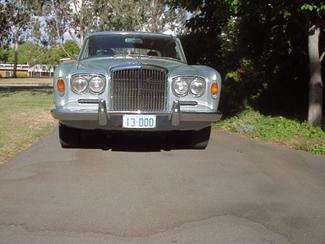 Once dismantled, this Silver Shadow showed signs that it was very close to failure indeed. This is a dire warning to all Silver Shadow and Bentley T-Series owners, including the Silver Shadow II and T2 owners alike. Just to prove that the beloved monster is back on the road.